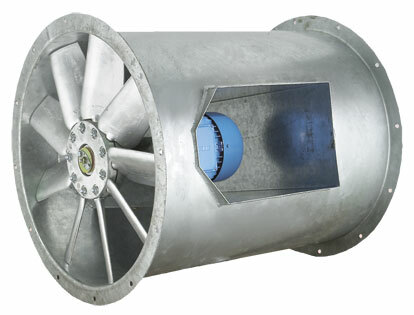 The Bifurcated Case Axial range of fans has been specifically developed to meet the need for an axial fan which can handle atmospheres normally detrimental to the life of the fan motor. By isolating the motor from the system airstream, the bifurcated fan can handle a wide variety of saturated and dustladen atmospheres, heated air and hot gases. The range has a split airway with adirect driven motor operating in ambient air within the motor compartment. They are suitable, as standard, for handling air temperatures up to +200°C. The Bifurcated Case Axial Fan range has a number of accessories available which include: Axial Ancillary Pack, Attenuator, Wire Inlet Guard, Coupling Flanges, Mounting Feet, AV Mounts and Speed Controllers. The motors are specially selected to operate within the motor compartment with the airstream in the duct system, at an elevated temperature. Motors are of the B3 foot mounting type, totally enclosed and fan cooled. Being foot mounted the motors can, in the event of a failure, be readily interchanged with a comparable frame size from a wide range of manufacturers to cover temperatures of up to 200°C. Where indicated, the motor is suitable for speed control by either an inverter or a 5-step auto transformer speed controller when the ambient air temperature is not higher than 60˚C. Single phase 220-240V 50 Hz supply are available in 5 sizes:-250, 315,400,450 and 500mm diameter. 250 to 400 diameter in either 2 or 4 pole versions, 500mm diameter in 4 pole. Three phase 380-440V 50Hz supply are available in eleven sizes 250, 315, 400, 450, 500, 560, 630 in either 2 or 4 pole versions (710, 800, 900 and 1000 dia are available as 4 pole). The aluminium alloy impellers are die cast and have an adjustable pitch which allows a wide range of air outputs to be selected. All the casings are manufactured in steel and hot dipped galvanised to BS EN ISO 1461 after fabrication. Motor mountings and fixings used in the assembly of the fan are zinc plated and passivated. Bifurcated fans have arrows showing the direction of the impeller rotation and airflow. All models are Form B running. To IP55, protected against dust and water jets from any angle, allowing outside applications. Tested to BS 848 Part 1 & 2. Published dB(A) figures are free field sound pressure levels at 3m with spherical propagation at a reference level of 2 x 10–5Pa (20 micro-Pascal). The inlet and outlet sound power level spectra figures are dB with a reference of 10–12 Watts (1 pico-watt). External cooling is provided by a fan mounted at the non-drive end of the motor, protected by a cover with a grid air intake. The airflow, guided by the fan cover, is directed longitudinally on the entire periphery of the motor in the channels formed by the frame ribs. Adequate space is provided within the motor compartment to ensure a plentiful supply of cooling air. The air within the motor compartment must not exceed 40˚C. For ambients in excess of this, please consult our Technical Services Department for further information.